Happy birthday Edna Miller (Mousekin series), Lore Segal (The Story of Mrs. Lovewright and Purrless Her Cat), Peter Roop (If You Lived with the Cherokees), Robert Sabuda (The Night Before Christmas), and Jackie French Koller (Nothing to Fear). It’s the birth date of Kenneth Grahame (1859–1932), The Wind in the Willows. In 1775 Thomas Paine publishes ‘African Slavery in America’ calling for emancipation of slaves and abolition of slavery. The New York Stock Exchange founded in 1817. Read Six Days in October by Karen Blumenthal. March has been designated Arts and Crafts Month. History, as the saying goes, is written by the winners. The disenfranchised, those who struggled for recognition, left few clues for those who read the record of history. 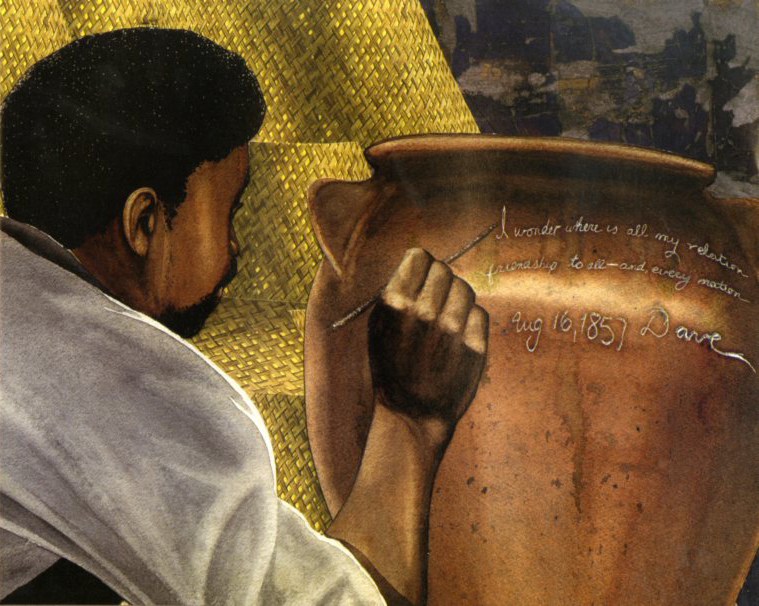 That is one of the reasons why Laban Carrick Hill’s Dave the Potter: Artist, Poet, Slave is such an important book. In his poetic text, Laban begins Dave’s saga: “To us / it is just dirt, / the ground we walk on. / Scoop up a handful. / The gritty grains slip / between your fingers.” This slave takes common clay and makes pots to store a season’s grain. He throws his pots, sometimes sixty pounds of clay at a time, and pulls shape out of this material—like “a magician pulling a rabbit out of a hat.” He rolls long ropes of clay, pounds in wood ash and sand, and, in the final spread, writes on his pot: “I wonder where / is all my relation / friendship to all— / and, every nation.” With only a first name, because slaves were not allowed to have last ones, Dave (c1801–c1862) was literate at a time when slaves were not allowed to read or write. He comes down through history because some of his 40,000 pots have survived, along with his notations on them. In a final note, Laban explains the primary source materials that can be found about this slave who lived in Pottersville, South Carolina, in the 1800s. This note shows readers the material the author drew upon to re-create the life of this extraordinary artist. To this lyrical text, Bryan Collier added watercolors, enhanced by collage, showing Dave at work. Although Collier had no pictures or photographs of Dave to work from, he created a figure of great dignity and sympathy. Dave was one of the finest artists of this time period, and he crafted objects that will last well beyond his lifetime. Collier brings him to life and shows him plying his craft. After seeing Dave at work and reading the simple but profound text, readers feel as if they know this man who was all but lost to the historical record—a true accomplishment on the part of both writer and artist. American history, Black history, art—all come together in this tribute. When you want to celebrate Arts and Craft Month, you can begin with no better book than Dave the Potter. Originally posted March 8, 2011. Updated for . A truly stunning book, and I was impressed with the backmatter that explained the true story behind the condensed version told in the poems and collages. Very deserving of a Caldecott Honor. A splendid example of how three artists can bring history to life with a poetic touch. This book has it all, and I’m glad it’s getting the recognition it deserves. Our organization, the Children’s Literature Connection, has a Caldecott / Newbery Tea every year. This year I volunteered to talk about, Dave the Potter. I wasn’t sure of what I could say about it at first but the more I read and looked at the reviews the more entranced I became. Consequently, I was very hard put to stay within the five minute time frame alloted. What a brave man Dave was, if he didn’t achieve a high status in life, I know he has achieved it now. What a great book! When I first read this book, I instantly fell in love with it. The illustrations and the way the book was designed both caught my eye initially, but the story of Dave is what made me want to take a copy home from the bookstore. Truly an excellent example of a book that combines all the best aspects of the picture book form into one memorable whole! I admit that it took me a few times of looking through this book to fully appreciate it, but once I realized how extraordinary the story and the illustrations are, I was hooked. Both Laban Hill and Bryan Collier were at the Simmons summer institute this past year. It was interesting to hear them both speak about the creative process for the book, and I was fortunate enough to purchase one of Collier’s original paintings for the book. This book astounds me. The art. The words. The story. Dave himself. Everything about it is gorgeous and everything about it evokes emotion. I am so grateful for authors and artists who discover these little known stories and bring them to life not only for children, but for adults too. Such a gift to the world. Stunning book. The colors are truly amazing, they seem to pop right off the pages. Thanks for selecting this one for your Book of the Day, Anita. It’s a wonderful book! 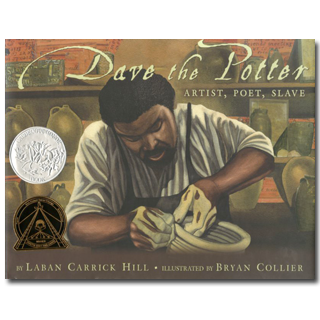 Originally it caught my eye in a book store because of two artists that deserve recognition, Bryan Collier as the wonderful Illustrator and of course Dave who has long been noted as an excellent potter in the antique field with little history. Thanks to the book he now has a history. I love this book and it has a Winston-Salem connection. The Museum of Early Southern Decorative Arts, part of Old Salem has a Dave the Potter pot and it’ gave me thrills to be so close to his work. If you can ever see one of his pots, jump at the chance.